Researchers believe rosemary also helps improve concentration, and could help asthma sufferers. Looks like: Prickly blue-green, evergreen needles. Tastes like: A little like pine, very fragrant. Fresh is so much better than dry (and easier on your mouth and insides), and since you can so easily buy, grow, or freeze it, you should really try and use fresh. If you must use dried, though, I won’t blame you. (Although if you cook with full, dry needles, I would try to strain it from the dish before you serve it so your guests don’t get a splinter in the roof of the mouth. Not pretty.). Grow it on your windowsill! It’s almost impossible to kill. It’s also at the grocery store, in the fresh produce section (look for branches and needles that bend, that aren’t dried and dead). Rosemary needs a pot with good drainage, high-quality soil (with some sand in it), lots of light, and occasionally, organic fertilizer. Rosemary grows really slowly, so pick a plant the size you want it to pretty much stay for several months. Once a year, to give your rosemary plant a little kick, either spread a tablespoon of dried crushed eggshells around the base of the plant, or pour a teaspoon of lime in the same place. You’ll know you’re doing it right if the needles on your rosemary bush stay bendy. Fun fact: Rosemary is called the “herb of remembrance,” and was used in both weddings and funerals as a sign of love. Brides used to give rosemary to their grooms to ensure their fidelity. Apparently, if the groom couldn’t smell the rosemary, he wasn’t capable of being faithful. Ladies, get out your herbs! Wash the whole sprig with the water on full force to get the dirt out from everywhere. If you want to just use the needles, hold the sprig at the top with one hand, and run the pinched fingers of your other hand down the stem opposite the direction the needles are growing. They should pop right off, and then you can pull the top needles off by hand. Chop it up by putting the needles in a pile and rocking a large kitchen knife over the pile. Rosemary doesn’t have to be cooked. You can eat the needles chopped up and tossed over a salad or something. But don’t eat the stem. In general, you should not eat any stem that’s woody. If you’re using fresh, you can throw a whole sprig (the stem with the needles attached) in what you’re cooking, and then remove the sprig before you serve it. 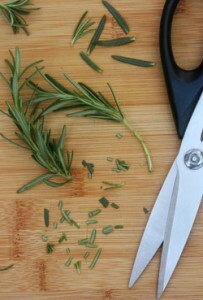 If you want to leave the rosemary in the dish, chop it up as small as you like and add it to your recipe. Rosemary sprigs are also great for baking in the oven tied to roasts or stuffed into chicken. Fresh • In the refrigerator, in a plastic bag for up to a week. Wash right before using. Frozen • Wash the rosemary and dry it thoroughly. Then stick the whole branches in a plastic bag in the freezer. Once it’s fully frozen, take the bag out and shake the needles off (they come off the stem when it’s frozen much easier than when it’s fresh; they just fall off). Toss the stem, and put all the needles back in the freezer bag. I actually use rosemary so much that I freeze huge bunches of it, and then store all the needles in a little glass jar in the freezer. Any time I need rosemary, I just scoop it out of the jar, put the jar back, and I’m good to go. Dried • In a glass jar, dried rosemary will last several months to several years. Best in: Sautés, stews, stuffings, dressings, and marinades, also with chicken, lamb, pork, and seafood; great with potatoes, and even in desserts. what a great tip! i learned this week too that stainless steel takes away the smell of onion and garlic on your fingers! wash your hands with the knife you chopped with and the smell just disappears!